On one hand, as I wind down summer by getting the most of the last few warm days, on the other, I am really looking forward to some fall shopping and dapper layering. In fact fall shopping is underway for me and this midi skirt made it's way to the top on my fall's 'it' list. The rich jewel tone with a slight sheen and thick textured fabric, ideal for cooler days, make the skirt all the more fall desirable. Don it with a blazer or cardigan in a softer tone for office and take this piece from desk to dinner by pairing it with a pastel shade fitted blouse (just as mine ) and a shawl/stole atop the blouse for cooler nights. To finish the look, red lips always work especially when worn with gray, my favorite all-times color combination. I had a few other things on my fall wish list, that I will proudly strike out soon once my #mailday is here ! What are you guys eyeing for fall ? Any particular trend are you counting on ? Congratulations to Jo from what Jo craves, she is the featured blogger of the week. 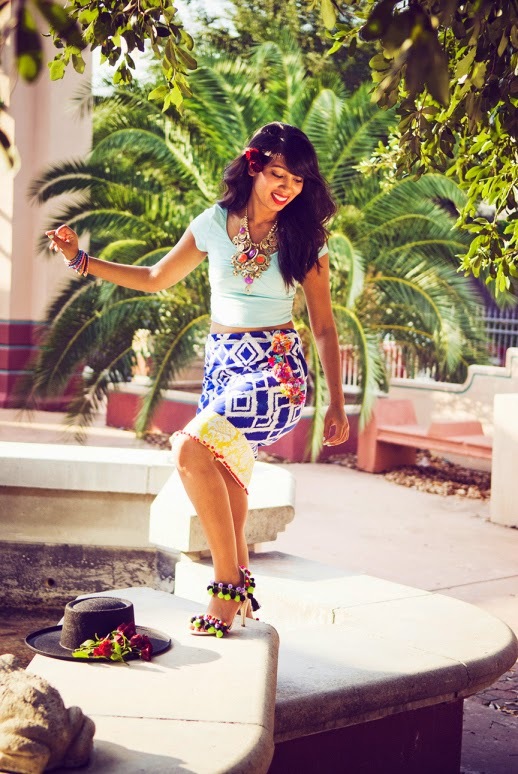 Do stop by her blog to get a daily dose of her eclectic and fun style. Linking up at :- trend spin. Have. A great day and thanks for stopping by.